Be the first to share your favorite memory, photo or story of Nanette. This memorial page is dedicated for family, friends and future generations to celebrate the life of their loved one. 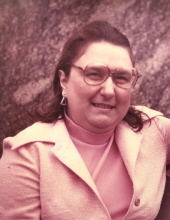 Nanette Stumbo, age 69 of Boone, died January 28, 2019 at the Mary Greeley Medical Center in Ames. Funeral Services will be Saturday, February 2, 2019, at 1:00 p.m., at the Schroeder-Reimers Memorial Chapel at Sixth and Marshall. Burial will be in the Rose Hill Cemetery, west of Boone. Nanette Lorraine (Carpenter) Stumbo, was born in Boone, Iowa on January 11, 1950, the daughter of William ‘Bill’ and Doris ‘Lolly’ (Paris) Carpenter. She graduated from Boone High School in 1968 and attended classes at Boone Junior College. On April 19, 1969, Nanette married Frank Stumbo in Boone. In earlier years, Nanette worked in assembly at Bourn’s in Ames. She later worked as a food product demonstrator in and around the area. Nanette enjoyed knitting, gig saw puzzles, reading, listening to old country music, and spending time with her Chihuahua dog, Squeeky. She and Frank enjoyed dining out and camping. Nanette was a member of the Women of the Moose. She is preceded in death by her parents; a sister Doris ‘Dory’ Conrad; a nephew, Robin Conrad. Nanette is survived by her husband, Frank of Boone; two nephews, Ricky Conrad of Boone and Ritchie Conrad and wife, Mary of Boone; her dog, Squeeky; other relatives. Friends may call at the Schroeder-Reimers Chapel on Friday, from 3 until 8 p.m. where the family will be present from 6 until 8 p.m.
On Saturday, friends may call from 9 a.m. until service time. In memory of Nanette, memorials may be directed to the family. To send flowers or a remembrance gift to the family of Nanette Stumbo, please visit our Tribute Store. "Email Address" would like to share the life celebration of Nanette Stumbo. Click on the "link" to go to share a favorite memory or leave a condolence message for the family.